You are currently browsing the tag archive for the ‘bullet’ tag. Ferrebeekeeper, like its author is meant to be benevolent and philosophical. Yet sometimes, despite our best intentions, we all must grapple with the unthinkable–this is why, today, we descend into a realm of unimaginable pain. Allow me to present the dreadful bullet ant (Paraponera clavata) also known as the 24-hour ant–the hymenopteran that sits at the apex of the Schmidt Sting Pain Index. 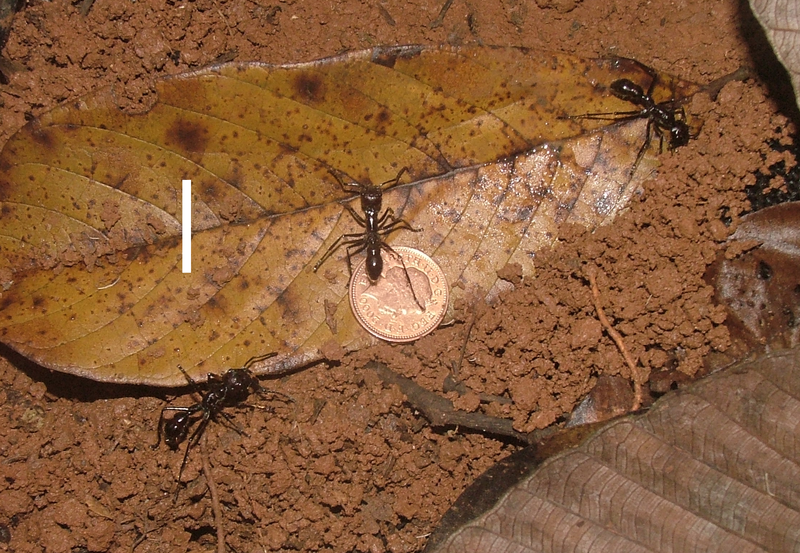 The worker ants of this genus are 18–30 mm (0.7 to 1.2 inches) long; there are no soldiers or other castes (and the queen herself is not much larger than any of the workers). They live in nests just underground and they hunt for small arthropods (and nectar) in the trees above. The common name of the ant comes from the 24 hour agony caused by the creature’s excruciating sting. Victims of the ant claim that being stung feels the same as being shot (and since the ant ranges from Nicaragua and eastern Honduras south to Paraguay, it seems likely that some of the people it has stung have sufficient personal experience to intelligently make the comparison). The ant’s venom is poneratoxin–a short chain of amino acids held together by covalent bonds–which acts as a neurotoxin. Poneratoxin affects voltage-dependent sodium ion channels which therefor disrupts synaptic transmission within the central nervous system. That sounds clinical and antiseptic, but people stung by the ant describe hours upon hour of unrelenting abject agony (along with partial paralysis and general flailing in the afflicted part). The ants have developed this potent sting as a means to deter animals which might unearth and disturb their underground nests (or otherwise harass them as they hunt and gather food). Unfortunately, the ants never reckoned on the madness of humans. 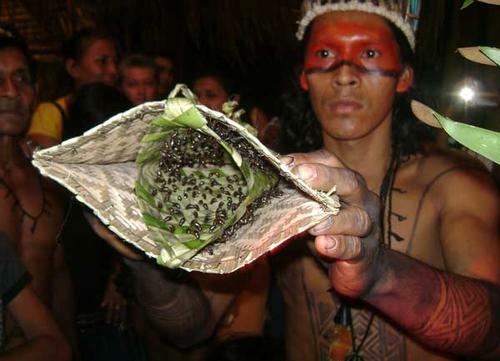 The Satere-Mawe people of Brazil, an Amazonian tribe of hunter gatherers utilize the ants as part of their manhood initiation ritual. Shamans lull a hive of ants into paralysis with smoke and then sew the living ants (stinger end out) into a sort of grass mitten. Thirteen-year-old boys take turns putting on the mitten for five to ten minutes. 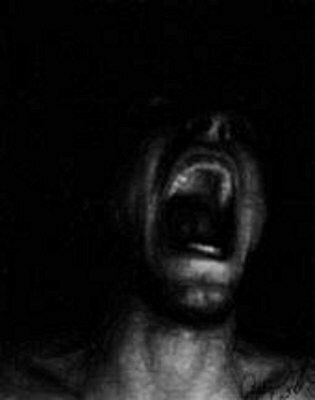 Then the initiates face 24 hours of partial paralysis as well as pain so intense that it causes hallucinations and madness (and some boys die from the ceremony). In order to be respected as a stoic and fearless warrior a young Satere-Mawe man might undergo this ritual a score of times.